Brewing is an application where the electric version is more energy efficient than the gas version. The reason is that the liquid is heated directly from the inside rather than forcing the heat into the liquid through the vessel from the outside. Much less energy is wasted. At 10 cents per Kilowatt-hour it costs about 25 - 50 cents per hour to run an electric system. Performance can also be very impressive. Starting at 55 deg F, you can raise the temperature of 15 gallons to 170 in 35 minutes. This is also typical of 30 gallons with two heating elements. People with no experience with electric brewing systems often assume that the heating element in direct contact with the wort results in a greater degree of carmelization or even scorching of the wort. This is not the case. The heating element is surrounded by a cloud of vaporized water, and as long as it is fully immersed the temperature will not rise above a certain point. We have done a great deal of research and development of electric brewing systems for home brewing applications this past decade. We have experimented with many materials, wattages, system configurations, power control solutions, and have built thousands of controllers and systems. Our design philosophy is high-performance without complication. We now build 1, 2 and 3-Vessel electric brewing systems. 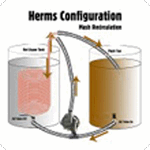 The most common type of 3-vessel electric brewing system for home brewers is HERMS (Heat Exchange Recirculating Mashing System). The first step in the all-grain brewing process is to heat a good-sized volume of water. It makes sense to place a heat exchanger in the hot liquor tank and use the heat for the mash tun too. Re-circulating the wort through the heat exchanger gently heats the wort, minimizes temperature variations within the mash tun, and helps improve the efficiency and clarity. 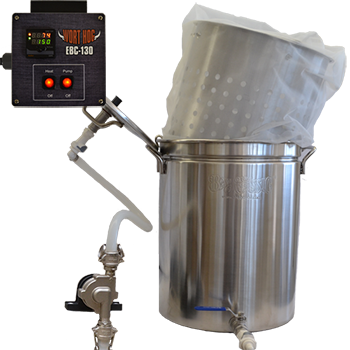 Most HERMS systems are designed to recirculate continuously, and maintain mash temp by controlling the HLT temp. This results in a slower rate of change since you have to move the temp of both masses. 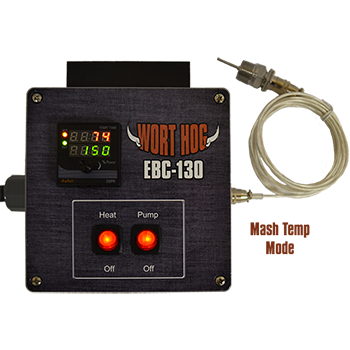 The Wort Hog EBC-330 provides independent temperature control of the HLT and the Mash. Mash temp is maintained automatically by turning on the pump to recirculate the wort through the heat exchanger when the temperature drops below the set-point. This lets you operate in a variety of ways. HLT temp can be set close to mash temp to have the pump run longer/more often during the mash, or the temperature differential can be increased to have more heat energy on tap for high-performance step-mashing. 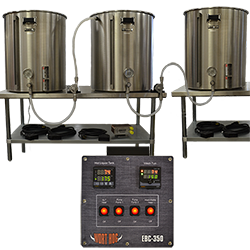 The Wort Hog EBC-350 is more of a RIMS controller, but operates like a typical HERMS controller, with the Mash temperature dependent on the HLT temp. Without a heating element plugged into the Mash/Kettle output, the mash side PID would be used for monitoring the mash temp. This controller can run two heating elements at once, and requires a 50A outlet. 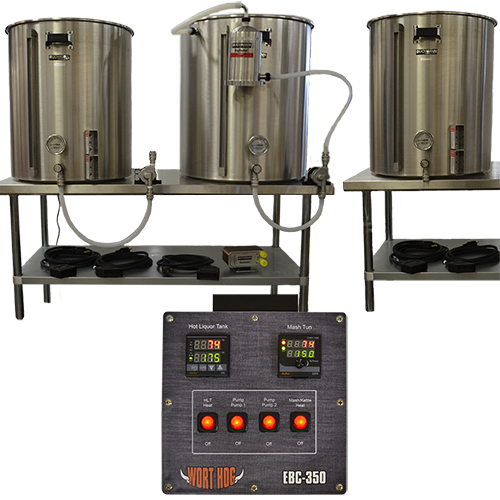 The new Wort Hog series controllers utilize the built-for-brewing Auber EZ Boil controller with Mash and Boil modes. This controller brings advanced features like timer functions, alarms, linear power control in Boil mode, and more. Simple menus to navigate, still easy to use. Typical brew house efficiency for 3-vessel systems using 15 gallon vessels is 76% for 10 gallon batches, 80+% for 5 gallon batch size. With systems using the 55 gallon vessels, it makes as much sense (or maybe more) to use a RIMS configuration for high-performance, and simpler plumbing. The Blichmann RIMS-Rocket is great for this. Dig deeper, watch some videos or customize a complete 3-Vessel system using our Build Your Own Brewery page. The BIAB method saves a good deal of time, space, and cost. Some sparging, squeezing the bag, and crushing the grain finer will get the efficiency back up in the 3-V range with many recipes. Our BIAB (Brew in a Bag) single-vessel system places the heating element under a basket, keeping the element away from the grains. This system is a Re-circulating Infusion Mash System (RIMS). The wort is re-circulated continuously while the temperature is monitored and the heat is modulated. Find more information, or configure a BIAB system here. In the early years we used the water heater style element, and the basket was necessary to keep the weight of the bag off of the element. 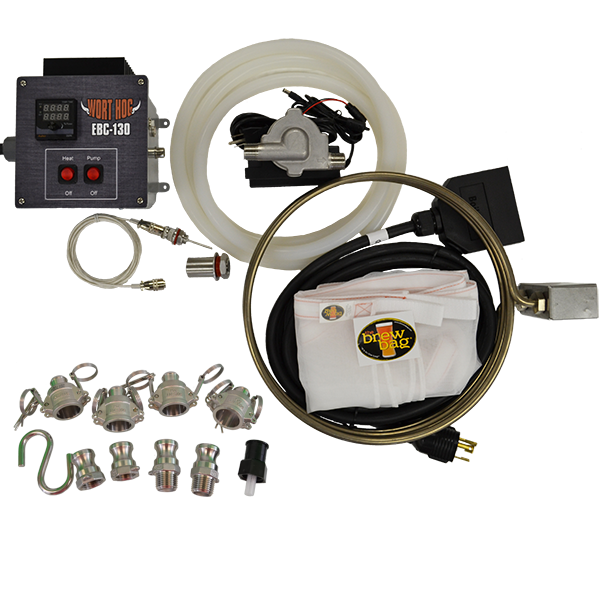 We have been using the Blichmann BoilCoil heating elements in our e-BIAB systems for several years, and when the Brew Bag appeared on the scene we realized that these are a powerful combination. The BoilCoil occupies the periphery of the vessel, and has the lowest watt-density on the planet. The Brew Bag is sturdy, well made with sealed seams, and reinforced with straps with grommets. Using them together, a basket is not required. The element does not bear the weight of the bag. As long as you don't run the vessel dry, you cannot melt the bag. A hoist, or some other lift assistance is required, but this means that you can use just about any vessel. The 2-Vessel Blichmann BrewEasy system is the newcomer, and is a big improvement on the BIAB method. We build electric versions with the Blichmann TopTier controller and LTE stand, or one that utilizes our EBC-130 controller. Both versions are powered by a Blichmann BoilCoil heating element in the kettle. The brew session begins with half of the water in each vessel, and it is recirculated from the kettle to the mash tun. This extra water capacity help to improve efficiency for larger batches and higher gravity recipes. Instead of lifting a hot heavy wet bag out the vessel, the system has a Blichmann Boilermaker with the best mash screen on the planet serving as a mash tun. The wort is drained into the kettle, and the empty vessel is removed from the stack at the end of the mash. We have been building electric brewery controllers for a decade, and have been improving them the whole time. We build several controller models. 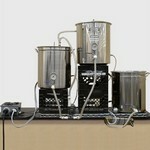 They are rugged, compact, simple to use, high performance, and ready to brew right out of the box. We have the best guarantee in the business. We will take care of any problem with a controller that we build as long as you own it. If you have a 10 year old controller that has a problem, you can simply send it in. We'll correct whatever might be wrong with it, and send it right back. The EKC is a simple electric kettle controller. 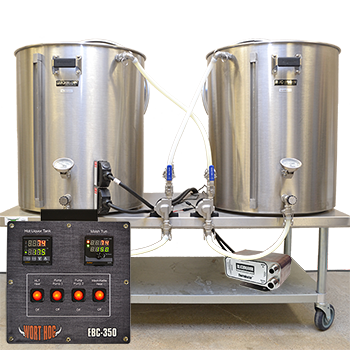 The Wort Hog EBC-330, and Wort Hog EBC-350 models are designed to control a 3-vessel system. 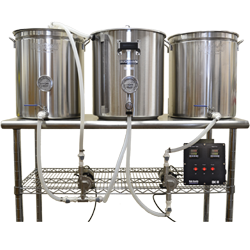 The Wort Hog models feature the new Auber EZ Boil controller, which provides advanced features like timer functions, alarms, accelerated boil, and linear power control in boil mode. 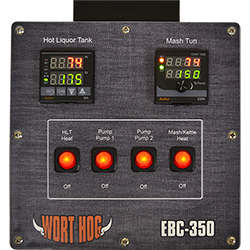 The Wort Hog EBC-330 automates the heat and pump functions to provide independent control of the HLT and Mash temperatures. Single heat output is shared between HLT and Kettle. Requires 30A service. 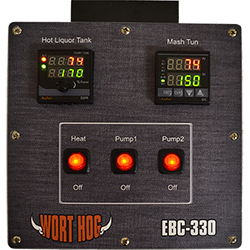 The Wort Hog EBC-350 has dual heat outputs. Requires 50A service. 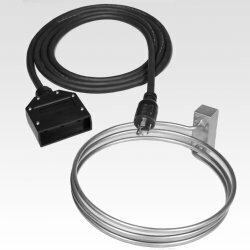 The Blichmann BoilCoil heating elements are superior to the water heater elements in three important ways; they feature a detachable cord, all-stainless construction, and have the lowest watt-density on the planet. We have waited years for a product like this, and feel that they are definitely worth the extra cost. Any comparison to a water heater element should consider the entire cost of the element installed in the vessel, with the cord and plug.